In a society that has a tendency to develop the “each for oneself, among peers!”, the arrival of the Open Spaces, Coworking, Flex Office reassure as for the ability of this society to reform starting with the “world of work”.It has often been said that the first place of sociabilization after school is the enterprise, and it is this very place that today “breaks down the walls”, erases the differences and transforms the way of conceiving multidisciplinary spaces, and the behaviors of their occupants. Unde r the impulse of the development of the NICTs, the Open Spaces fluidify the communication, facilitate the exchanges between collaborators, but-“other side of the coin” -, these collective spaces are source of noise. The noise that harms the concentration, generates stress, making the work in open space unpleasant. It is therefore important to design integrated spaces offering privacy and user-friendliness without confinement. We are fortunate to have technical materials that have become more efficient, effective and aesthetic. 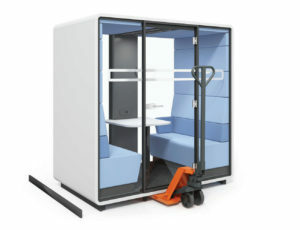 Such as ceiling tiles, glazed partitions, sound-absorbing panels, as well as carpets and other wall and floor coverings that use materials with phonic properties that promote noise reduction in open spaces. Offices nice to live in improve well-being at work and have positive effects on team cohesion and employee creativity. As we just saw at ORGATEC 2018, furniture is not left out. 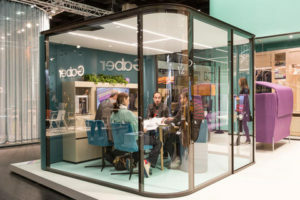 It is as aesthetic as isophonic, such as partitions, armchairs and the famous “phone boxes”, which seem to have become a panacea for user companies. The development of “Open Spaces” is an opportunity to encourage employees to adopt responsible behavior. For this it is important to install equipment that allows visual identification of specific areas where you have to lower your voice. In the same way, the teams have a specific work area, and spaces to meet within their own offices, but also relaxation, informal meetings areas, often located in zones of passage, in the manner of “Lounges”, which facilitates exchanges. But make no mistake, the proliferation of “phone boxes” is reminiscent of a return of doors and partitions as in the period “post landscape offices”. 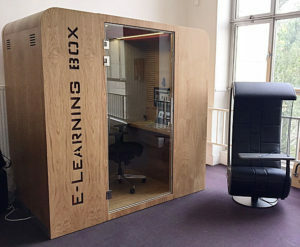 And, by invading the world of “open spaces”, the “phone boxes” that often turn into mini meeting places, cancel the friendly communicating, transparent and collaborative aspect of “open spaces”. Certainly the “phone boxes”, derived from the filiation of the good old telephone booth, are useful to phone confidentially without disturbing people around you. In addition, they often have a “look” treated in a playful, artistic way, as at SBS. In addition, they can be moved simply or moving, as in Mikomax. On the other hand, we totally subscribe to closed meeting spaces, but in acoustic glass, in the manner of ESTEL, to increase transparency, and to avoid breaks in visual perspectives in these collaborative spaces. allowing meetings in complete confidentiality and without hearing aggression, and the v ery fact that they are transparent, prevents these meetings from dragging on. 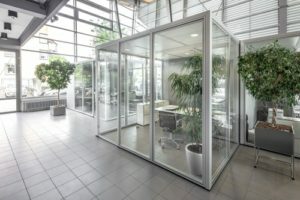 So yes for us, long live the transparency of the glass that allows to have “the room in the room” as at Dauphin Group. This theme will be dealt with in issue 54 of the Ergonoma Journal distributed in Stockholm during the “Stockholm Furniture and Light Fair” from 5 to 9 February 2019, whose theme for 2019 is “Challenges for the Future”.